I’ve never believed in love at first sight. That changed when I first walked up the path to the school to be given the most amazing welcome I have ever experienced. The children were so excited, kind, full of life and desperate to talk and play with me. The months leading up to my time in Ghana were full of anxiety; worrying over injections, catching malaria and even dying of rabies. However, these months of anxiety were truly worth it as I had the most amazing week I have ever had. We arrived to find the school made of flimsy mud walls, which we managed to pull down with our bare hands. Most of us found the building work very tough, with the humidity being sometimes unbearable and not having the arm strength to carry a brick without dropping it. Slowly but surely (with many a hiccup), day by day the school building stood taller. At our first day at the school Tianna and I taught a bracelet making class; I have never seen children more grateful for some beads and a piece of coloured string. Seeing the children come back to the school every day with the bracelets still on was so lovely and rewarding. We had a party at the school on the last day where we enjoyed a beautiful show put on by the children. At every opportunity they had they would pull us all on to the dance floor to join in with some care free, super exciting dancing. Saying goodbye at the end of the week was probably one of the hardest parts of the trip. When sitting in the mini bus driving away from the village, you could not help but let a tear fall at the sight of little children running after us waving frantically and shouting “bye bye” as loud as they could. Returning to the privileged life I have in the UK has been very hard, doing and using everyday ‘normal’ things seem unnecessary and greedy. My passion for equality in education and welfare is at an all-time high. 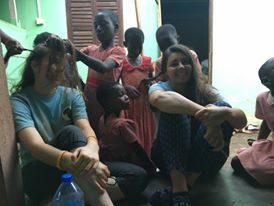 I miss coming home every night with a new hair style the children have done for me. I miss the sound of real laughter (quite a lot of the time they were laughing at me) and I miss seeing the pure joy the children that spread to everyone they met. At university this year (University of Kent) I am the Vice President of Kent Dance Society. We have decided as a committee to have Humanitas Charity as our global charity of the year and we are going to send some dance t-shirts to the school we built in the village. We are very excited to start fundraising for Humanitas with our shows and workshops. Thank you to all my friends and family who bought my handmade jewellery and t-shirts which allowed me to fund this trip of a life time. The people and children of Ayensuako have given me a new lease of life. Ghana you have my heart; I will see you next year.